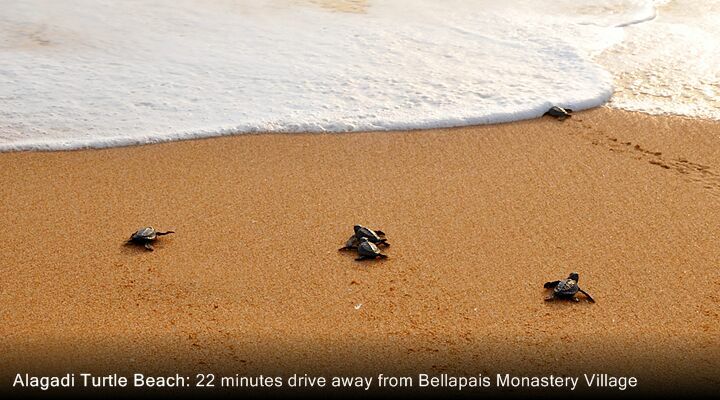 Bellapais Monastery Village offers 4 star comforts with 5 star views and service, and many guests come back year after year. Soak up the sunshine beside the swimming pool, before dining under the stars on the terrace with the lights of Kyrenia below spread like a jewelled carpet - magnificent! 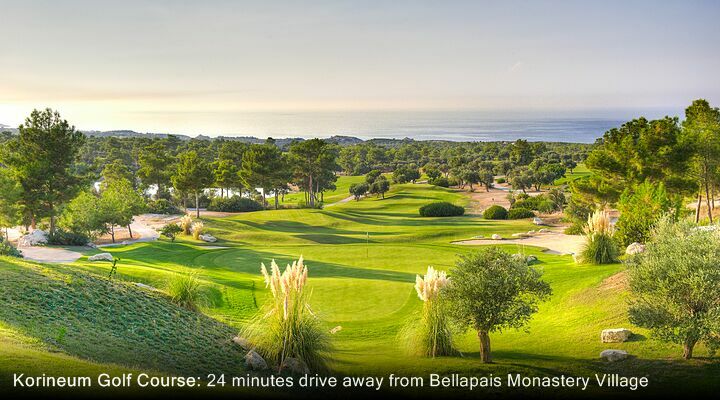 From the moment you turn off the mountain road towards Bellapais to the 4 star Bellapais Monastery Village hotel, you'll be struck by the amazing views down the mountainside to the coast below. 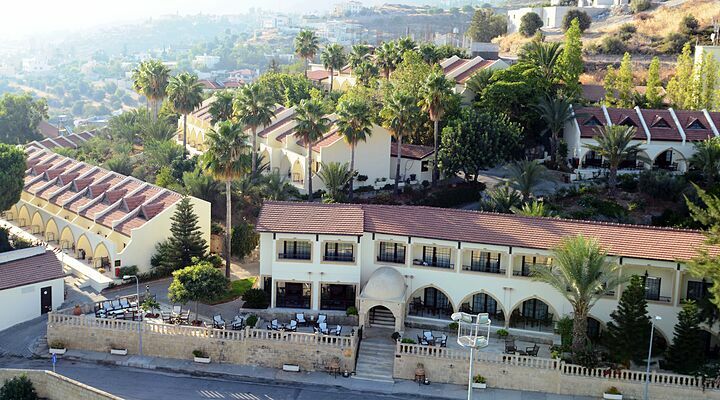 The Bellapais Monastery Village makes the most of its elevated position above Kyrenia, as every part of the hotel presents a different view to enjoy. 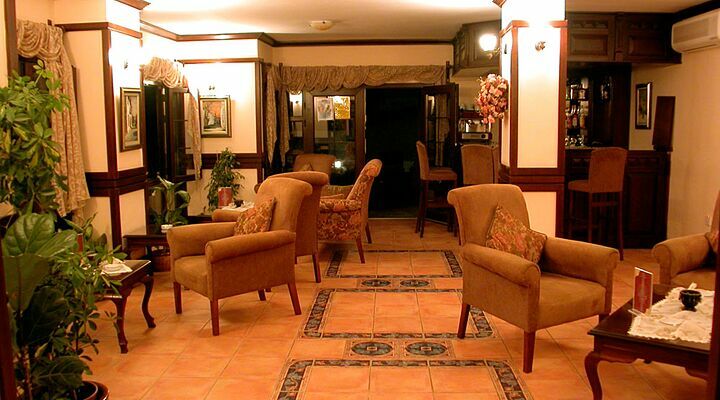 With the relaxing atmosphere and discreet services of a country club and an adults only policy (no under 12's allowed), this is a delightful place to stay. Totally chill out on your North Cyprus holiday, whether you're soaking up the sun by the pool, dining al fresco on the roof terrace, or just sitting on your private villa terrace. 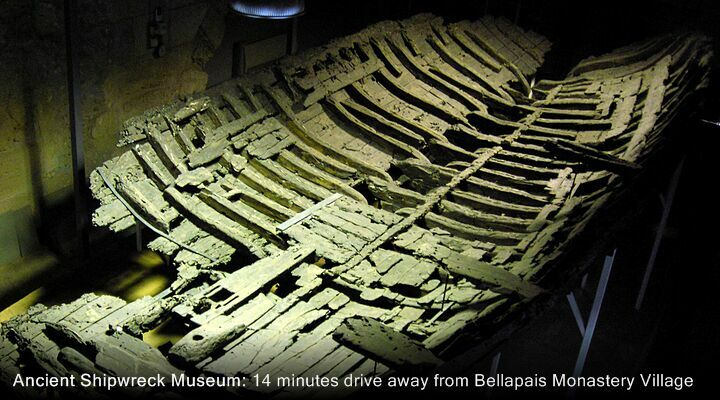 Want to know more about Bellapais Monastery Village? 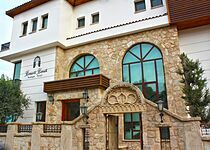 Call the GNC team for an 'insider' view of our North Cyprus holiday hotels on 0800 612 6600 - calls are free from UK landlines. 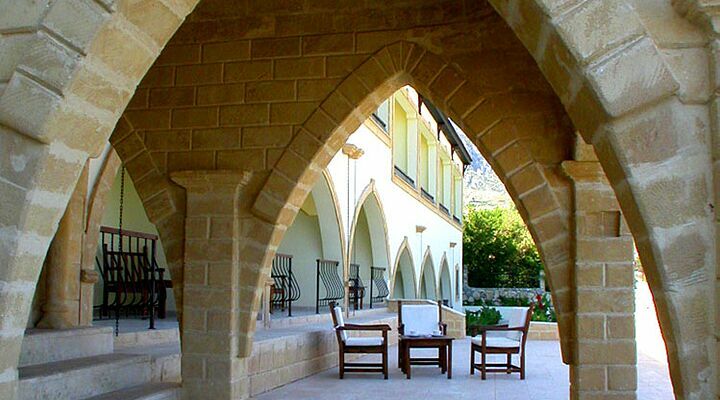 Enjoy the privacy of your own villa at the Bellapais Monastery Village, complete with an elegant terrace framed with a classical arch. Each two storey mini villa is well appointed with a downstairs lounge and bathroom, and a mezzanine bedroom with traditional lattice wood ceiling. Villas are kept cool in summer and warm in winter with split air conditioning, and each has a fully tiled modern bathroom with shower and hairdryer. 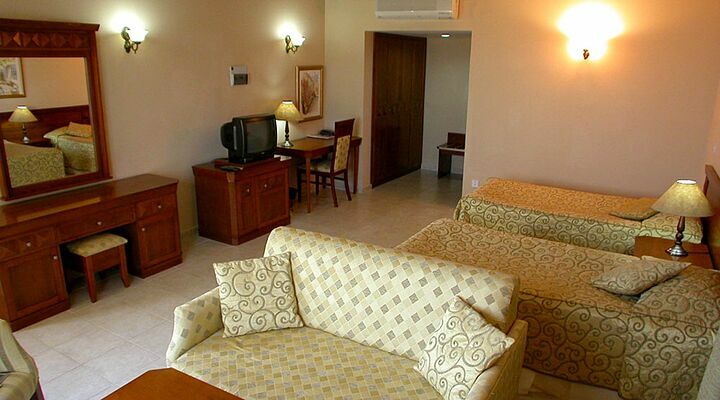 Villas also have satellite TV, a minibar and safe deposit box. The 16 hotel rooms at the Bellapais Monastery Village are tastefully decorated with local wood and gold-coloured furnishing fabrics. Each room has every comfort for your stay, including air conditioning, a private balcony with wrought iron railings for making the most of those sweeping views down to the sea. You'll also find an en-suite bathroom with WC and shower, satellite tv, tea and coffee making facilities, mini bar, and a small in-room safe. 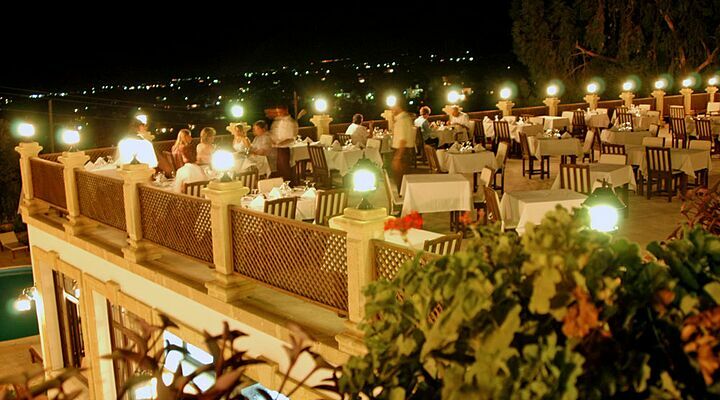 Dining at the Bellapais Monastery Village is a delight, with wooden tables and comfortable rattan chairs set out on the top terrace so that every table can enjoy cooling breezes and 180 degree views of mountain and sea. 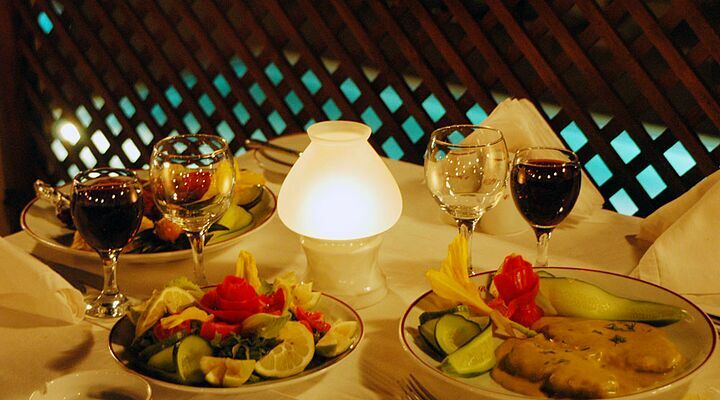 Delicious open buffet or the choice of A la carte The whole hotel is bathed in the gentle glow of lights, perfectly complimenting the twinkle of stars above and the shimmering lights of Kyrenia below. 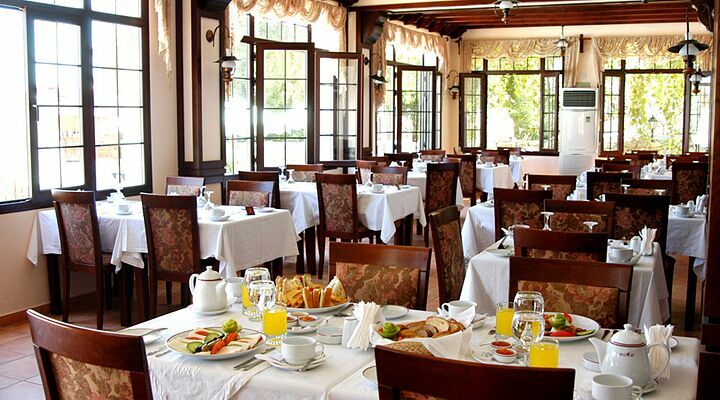 The main restaurant inside has traditional style windows and tiled floor giving it a truly Cypriot feel not often found in 4 star North Cyprus holiday hotels. There is a weekly Kleftiko (slow roast lamb) evening during summer months and yes, the staff will get everyone up and dancing! 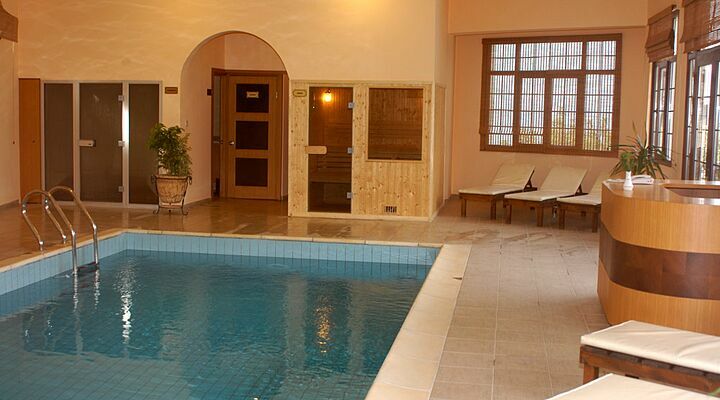 Or, more accurately, two pools with a view and a half! 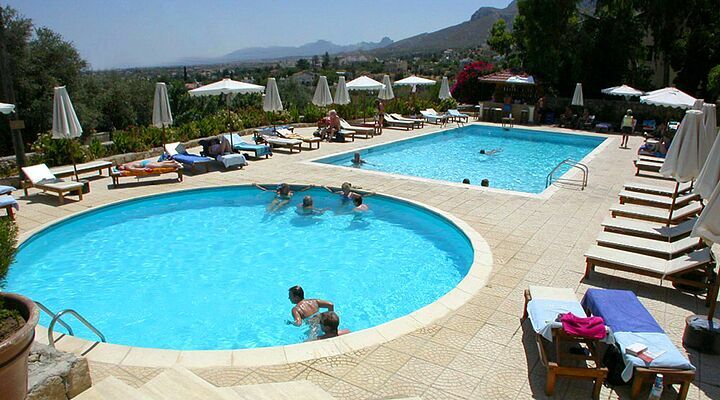 The square pool offers the chance to stretch out and swim in the Cyprus sunshine, whilst the shallower round pool is ideal for a cooling dip and chat with new-found friends. Thanks to the hotel's no children policy, you can enjoy the peace and quiet on a comfortable sun lounger, drink in hand from the pool bar, all day long. 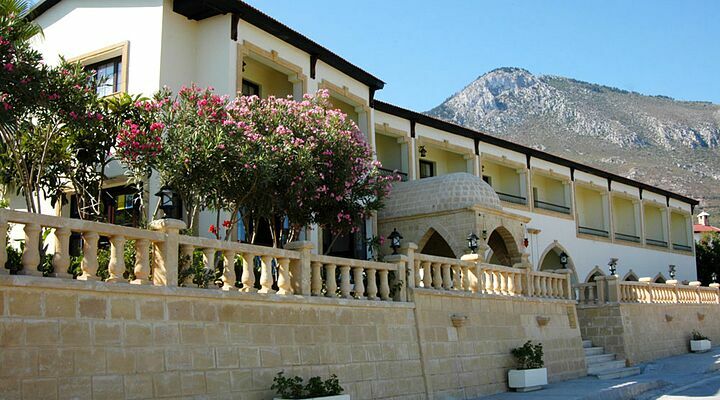 If you like a more lively atmosphere, (and more kids around) all guests are welcome to use the facilities at the Bellapais Monastery Village's sister hotel Oscar Resort down in Kyrenia. 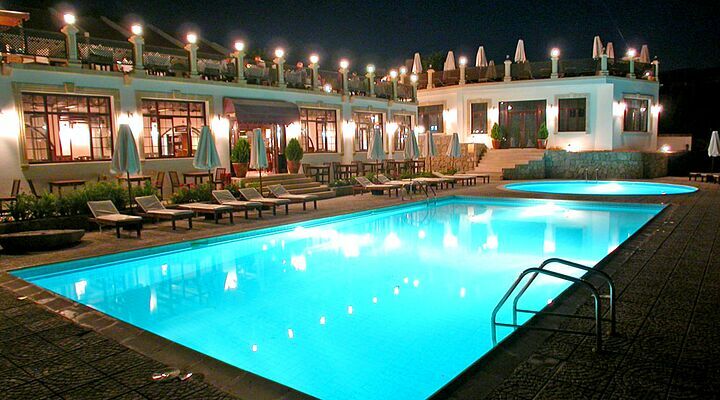 For winter sun holidays in Cyprus, the hotel also has a spa-style inside swimming pool with comfortable double day beds, a sauna, a steam room and exercise bikes for the energetic! Massages can also be arranged - just ask at reception. 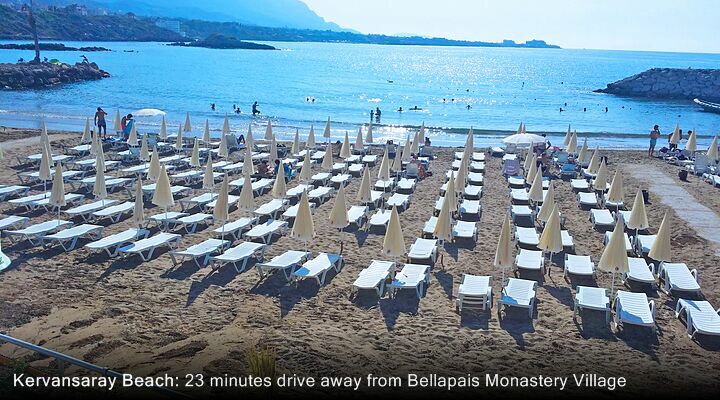 The Bellapais Monastery Village staff are experts at making you feel at home, and anticipating your requirements, be it a drink by the pool, a lunchtime snack, a book from the lobby library, or another cushion on your sun bed on the top terrace. Bellapais village is dominated by the stunning ruins of its ancient abbey, perched high on the mountainside. The village is a delightful mix of traditional restaurants, cafes and shops, with little streets winding into the mountains, all within a 20 minute of the Bellapais Monastery Village uphill . Walkers will love the location too, with easy access to mountain trails to enjoy spring flowers and cool breezes in the summer. 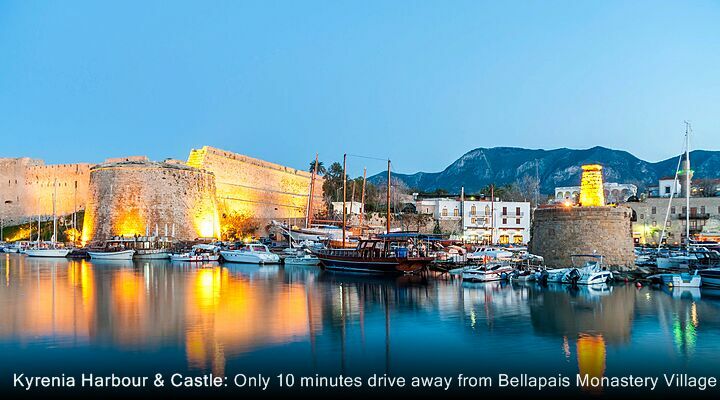 The pretty harbour and mighty castle of Kyrenia are just 3kms downhill, perfect for a day out exploring the twisting medieval streets or enjoying lunch by the sea. A courtesy bus runs daily during the summer season from the hotel to Kyrenia or hire a car and explore more of North Cyprus. 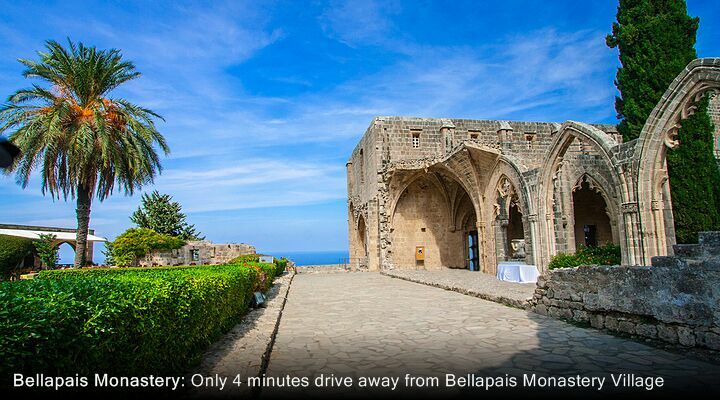 Thanks to its position above Kyrenia rather than the far side of it, transfers from Ercan International Airport to the Bellapais Monastery Village take just 30 minutes. 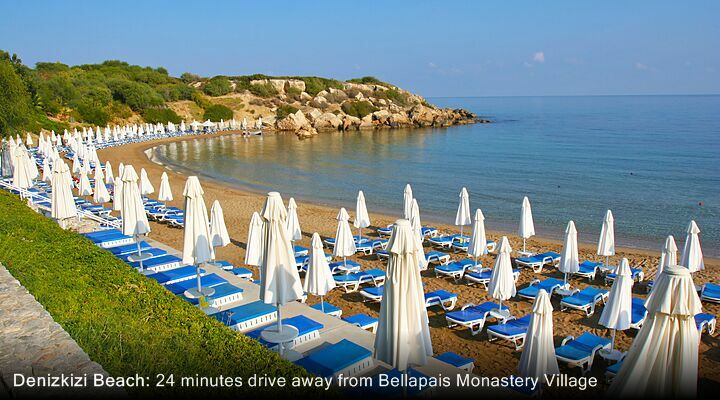 So, with a flight to North Cyprus, you could go from plane steps to poolside in under an hour! Please note that due to the hillside location and number of steps, this hotel is not suitable for those with mobility difficulties. Children must be aged 12 or over.